I believe, building a defined set of system/rules is important when you start designing something. 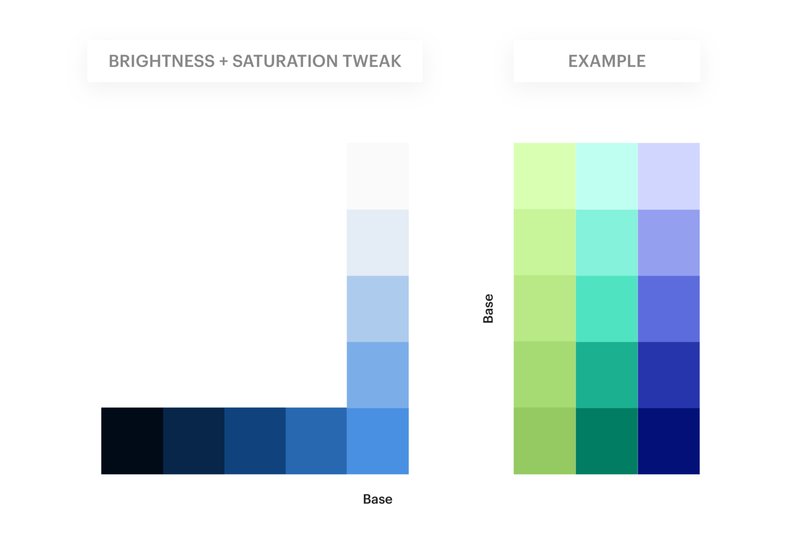 Colors are a subset of a brand’s DLS (Design Language System), and it is one of the major areas, where designers miss out on building a defined set of rules for their usage of colors. In this article, we will discuss some techniques to define a set of rules to generate color variations, that can scale to a larger spectrum of usage and also could be applied across any brand palette in future. You can choose any of these techniques or combine them to create your own. Hue is color (blue, green, red, etc.). Chroma is the purity of a color (a high chroma has no added black, white or gray). Saturation is how much of a given hue is present (lower saturation having less hue, and closer to white). Brightness/Value refers to how light or dark a color is (dark having a low brightness/value). Opacity refers to how transparent or opaque a color is (high transparency having low opacity). Tones are created by adding gray to a color, making it duller than the original. Shades are created by adding black to a color, making it darker than the original. Tints are created by adding white to a color, making it lighter than the original. The above graph shows the relation between Brightness, Opacity, Tints, Tones, Shades & Chroma for a particular Hue. This graph was built using a 10-point scale. What it means is, the Opacity of color varies by 10% across the X-axis and the Brightness varies by 10% across the Y-axis. We will be using simplified version of the above graph, using a 25-point scale to build our Base Framework Grid. This grid will serve as our playground with multiple possibilities to generate colors. I have used Sketch App 💎 to create the framework grid but one can create the same in other design tools like Photoshop/Illustrator/Figma/Gimp/etc. We’ll be using the popular HSB Color system all across. Step 1. Select a Base Hue. Create a 50 x 50 px square with this Hue. Here for example, I chose a blue Hue (H 212, S 67, B 89). Step 2. Create a 10 x 10 px white square tile (H 0, S 0, B 100). Step 3. Duplicate these white tiles (5 rows, 5 columns) so that it covers up the entire base square of Step 1. Step 4. Reduce the Opacity of each column of white tiles by 25% from left to right. Step 5. Reduce the Brightness of each row of white tiles by 25% from top to bottom. To better visualise the color variations, I used 3 more base hues as examples in the methods below. You can obviously choose your own colors. This method is the most commonly used, due to its simplicity. The Base Framework Grid you created above was generated using this method. The Opacity & Brightness of the white tiles above your base Hue, runs from 100% to 0% (left to right) and 0% to 100% (bottom to top) respectively. The Color theme on the right side was created using our 3 base Hues (mentioned above) and picking the Opacity & Brightness values from the centre column on the left side (indicated by arrow). In this method, we use the same base framework, and change the Blending mode of the white tiles to Overlay. This creates a beautiful Hue difference across the grid. 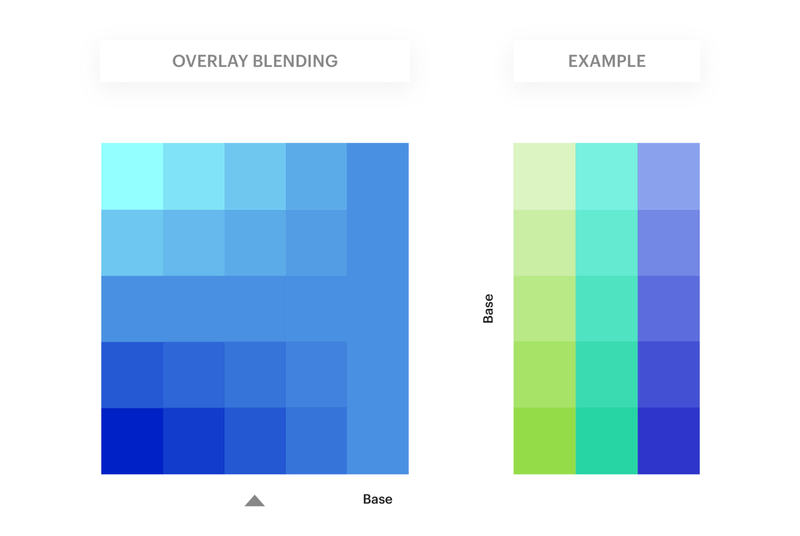 Similar to #2 Overlay Blending method, here we change the Blending mode of the white tiles to Soft-Light. This creates a beautiful Saturation difference across the grid. We then select all these white tiles, and duplicate them twice. This creates a stronger Saturation difference, and hence better color vividness. This method uses the grid framework we created in #2 Overlay Blending method. We then choose any Cool color (blue, for example). Create a Rectangle of this color and place it across the entire grid. Change its Blending mode to Overlay. The resulting color grid has a Vivid cool effect to it. Very similar to the #4 Cool Color Overlay Blending method, here instead we choose any Warm color (orange, for example). Create a Rectangle of this color and place it across the entire grid. Change its Blending mode to Overlay. The resulting color grid has a Dramatic warm effect to it. This method is a little different & easier from the above mentioned methods. The white tiles above the base Hue are not present in this grid. 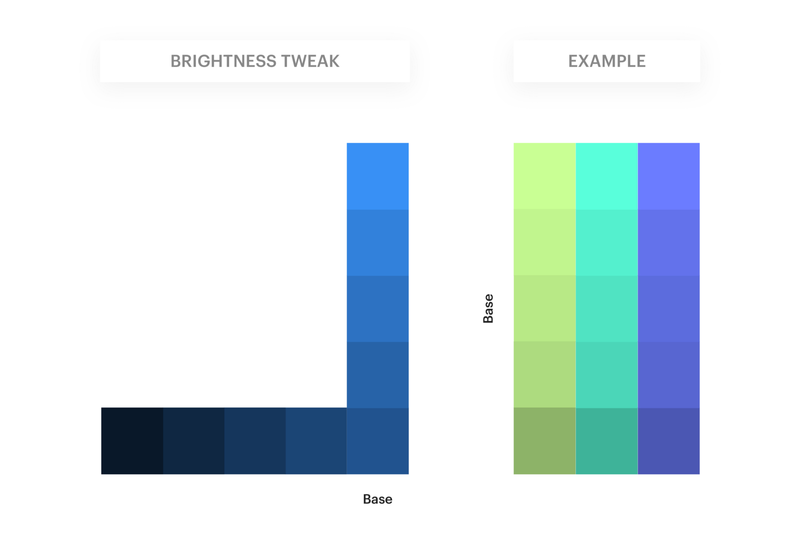 Instead, we create tiles of the base color (as shown in the image below), and create a range of Light & Dark color by increasing & decreasing its Brightness value respectively. The Color theme on the right side was created using our 3 base Hues and then simply increasing & decreasing the Brightness values to create Light & Dark variations respectively. This method uses the same grid of #6 Brightness Tweak method. Here, we tweak the Saturation values alongside the Brightness values. We create a range of Light & Dark color by increasing & decreasing its Brightness value, and simultaneously decreasing & increasing the Saturation values respectively. Rule 1: Lighter Color variation = Lower Saturation + Higher Brightness. Rule 2: Darker color variation = Higher Saturation + Lower Brightness. 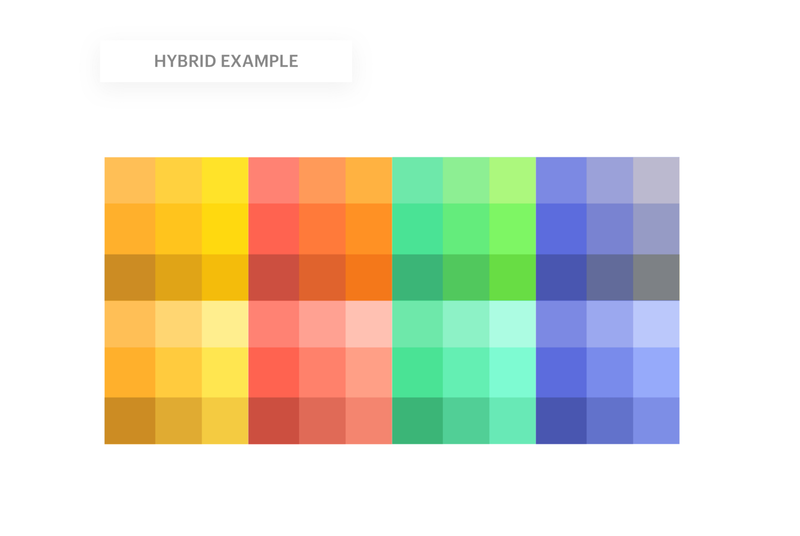 Here’s a hybrid example that combines method #1, #3, #4 and #5 to generate a beautiful palette of colors. This was inspired by one of the articles on Sketch Tricks to build a color system quickly in Sketch App. It’s all about using your tools and harnessing the basics of design elements. Combination of different elements/techniques often opens up a door to infinite possibilities. 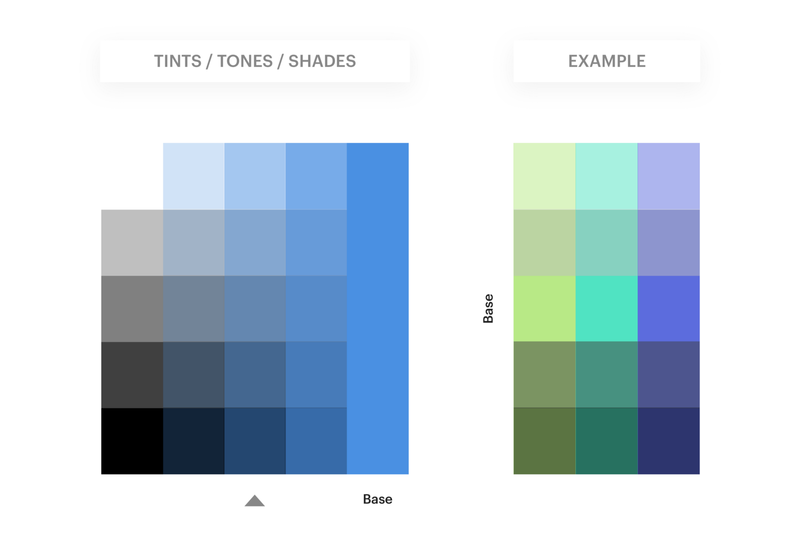 There are even more methods to generate color themes. As you see, creating a Base Framework Grid was the most important part. The grid served as a playground to your imagination to generate color systems. 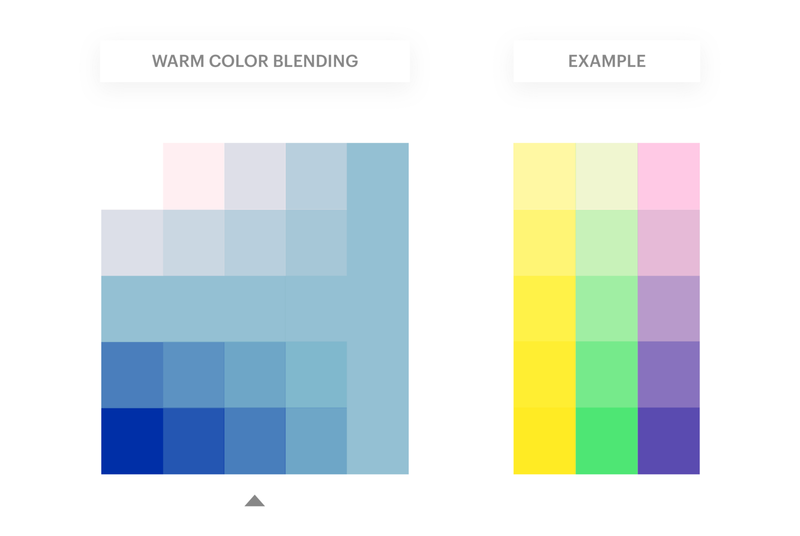 You can combine multiple methods to create an entirely new set of colors from your base Hue. (try Gradients instead of solid base Hue 😉). You can also use Justin Mezzell’s Adjustment Layers Method to create Vintage color sets. I Tweet design & tech related stuff regularly, and my work-in-progresses on Dribbble. You can find the other side of me on Instagram. Thanks to Ivy Mukherjee, Samir Bellare, and Adit Gupta.